“I’m a nice guy” is right up there with “Infinite Jest is my favorite book” and “You like Huey Lewis and the News?” on the list of things a man can say that should immediately raise red flags. Philo Harris, the hero of Image’s upcoming comic Death of Love, really wants you to know that he’s a nice guy. Written by Justin Jordan with illustrations from artist Donal DeLay and colorist Omar Estévez, Death of Love’s premise reads like a cautionary tale. It’s about a dude who just doesn’t get that love connections usually begin when two people treat each other like, you know, people. Like many self-proclaimed Nice Guys™, Philo has difficulty connecting to women even though he does all of the things that Nice Guys™ are supposed to do. He’ll listen to women speak about their emotions, watch their pets, and even buy them gifts, but even still—he gets nowhere. When Philo realizes that his patented Nice Guy™ techniques aren’t working, he begins taking special pills meant to help him find love, but the drug has the unintended side effect of giving him the ability to see the “cupidae,” Cupid-like creatures invisible to most that cause people to fall in love. 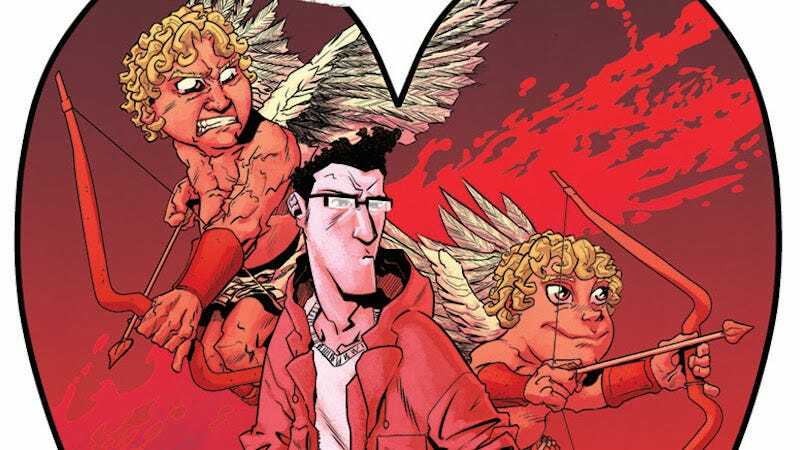 Naturally, Philo decides to use his newfound abilities to do what anyone who’s never had all that much luck with romance would do: Kill cupidae. One can only imagine what sort of chaos Philo will end up wreaking on the world with his crusade against love. Perhaps he’ll learn a lesson, though if we’re being honest here, Nice Guys™ seldom do. We’ll find out when Death of Love drops next February, just in time for Valentine’s Day. What The Hell Is A Nice Guy™, Anyway?